Heat Detectors, Smoke Detectors, Flame Detectors and other types of Initiating Devices are explained in Chapter 3 of the National Fire Alarm and Signalling Code. DEFINITIONS. Always read the code definitions so you understand what the word means in the Code. Another type of widely used heat detector is the Rate of Rise detector. This detector contains a chamber with a calibrated vent hole and diaphragm at the top. An actuator strip is located above the diaphragm, just below a set of contacts. When the air outside the detector rises in temperature, the air inside the chamber likewise gets warmer, and as we all know, it expands. If the air expands gradually, it escapes through the calibrated vent. If the air heats rapidly and expands too fast to be vented, pressure is exerted on the diaphragm, causing it to bulge, pushing the contacts closed and placing the detector in alarm. The rate of temperature rise required to place a detector in alarm is 15o F in one minute, or equivalent, such as five de- grees in 20 seconds. Therefore, this detector does not depend upon high temperatures to go into alarm, but senses a rapid rise in temperature. The rate of rise detector is self-restoring, since the diaphragm returns to normal as the ambient air cools. The ROR detector often has a fixed temperature feature as a “back-up” in the event high temperatures are reached, while the temperature rises too slowly to activate the rate of rise feature. This detector is referred to as a “combination Fixed Temperature and Rate of Rise” detector. The pictures to the left show typical rate-of-rise/fixed temperature detectors. The top picture shows a high profile detector while the bottom shows a low profile version developed for use in finished interiors. Both operate identically. fusible alloy could absorb enough heat to melt it. This is referred to as thermal lag. The rate anticipation detector was designed to eliminate ther- mal lag. The rate anticipation detector is cylindrical (cigar shaped), sealed, and contains a pair of bowed struts each containing a contact. 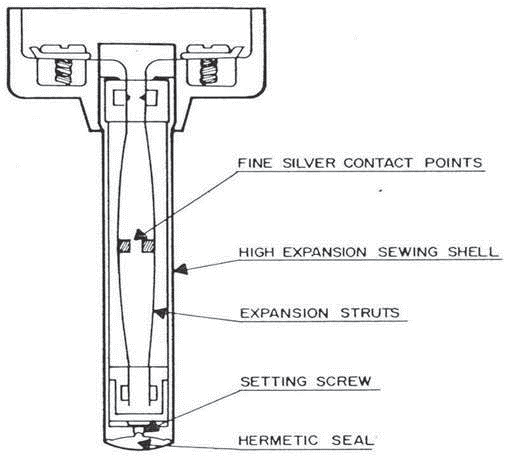 In normal operation, the struts are bowed away from each other, separating the contacts. The cylindrical case is made from a special alloy with a coefficient of expansion that allows it to expand rapidly. When the am- bient temperature rises, the detector case expands, (actually stretching or elongating) until the internal struts are likewise stretched, causing their contacts to close, placing the detector in alarm. This detector has very little thermal lag, and will go into alarm as soon as the ambient temperature reaches the setpoint of the detector regardless of the rate of rise. Since this detector is sealed, it is a simple matter to weatherproof or make it explosion proof. The picture to the right shows this type of detector. The fixed temperature detector (FT) alarms when the ambient temperature reaches a certain setpoint, commonly 135 or 200o F, and ignores any fluctuations or sudden increases in temperature. Therefore, the fixed temperature detector is best suited for applications where rapid fluctuations in temperature can be encountered, such as attics, boiler rooms, kitchens, bathrooms and loading platforms with forced hot air heaters. The 200o F version should al- ways be employed in attics, boiler rooms, garages or kitchens. The most common fixed temperature detectors are usually destroyed upon activation and must be replaced after the alarm. The rate anticipation detector outperforms the fixed temperature detector since it will alarm faster than the FT detector in the event of a rapid temperature increase up to the setpoint. It is costlier than the FT detector, but is also self-restoring, so doesn’t require replacement after actuation. This is a great advantage in installations where staging or scaffolding would be required to replace the detector. ROR and FT detectors are available in weatherproof and explosion proof ver- sions, but require fairly costly housings for these versions. The rate anticipation detector, being sealed, lends itself to weatherproof or explosion proof applica- tions at a moderate cost. The rated spacings of these detectors vary. The ROR detector mounted on low ceilings can be spaced up to 50 feet on centers, depending on its listing, while the fusible element FT detector is typically rated at only 15 feet on centers. The bimetallic strip is rated for even less. Electronic/thermistor detectors may be rated for greater spacings.